Ashington’s miserable record against Guisborough Town continued on Saturday as they were on the wrong end of a four-goal score line. Combing back through the Northern League archive unearths that the Wansbeck side are still searching for a first ever win at the King George V ground. On Saturday they did have chances, but once Danny Earl had added his second goal of the game ten minutes after the break, the contest was effectively over. Indeed it could have been a heavier defeat as Guisborough hit the woodwork on three occasions and yet again inspirational goalkeeper Conor Grant earned the man of the match award with a brilliant display between the posts. On an extremely chilly afternoon on Teesside, Washington-based referee Danny Markham had a good hard look at the ground before giving the game the thumbs up. The action began almost from the off as Guisborough could so easily have gone in front after a mere 47 seconds. They immediately made inroads with Curtis Round having a shot turned away by Grant, and from the left wing corner which ensued, an effort from Adam Gell from the edge of the area thudded against the bar and was cleared. But in the seventh minute it was home stopper Nicky Liversedge who prevented an opener from the visitors following a simply constructed three-man move. 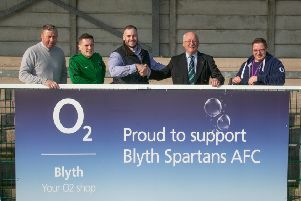 Grant’s throw out to Phil Airey saw the former Blyth and Whitley Bay man pump forward a superb ball over the top which released Marc Walton but the striker saw his attempted chip over the keeper from 20 yards tipped away. Guisborough broke through in the 11th minute with a goal of simplicity. Andy Ferrell lost possession on the halfway line to Earl who found Luke Bythway on the left and when he crossed the untracked Earl finished off the move with ease by side-footing into an empty net. Ashington had handed a full debut to Brad McClelland, a recent signing from Alnwick Town, and on the quarter hour following a good build-up, Andrew Johnson found the newcomer whose drive from 18 yards was palmed away by Liversedge. Minutes later, Walton threaded the ball through for Johnson who went past the advancing keeper but his cross was ahead of McClelland. Johnson had another effort blocked before the home side took control. Earl pulled the ball back where Gell shot over, then a one-two between Gell and Bythway saw the latter’s drive pushed away by Grant. On the stroke of half-time Grant distinguished himself by making two great saves to deny Bythway and Earl. Five minutes after the break a left footer from Andrew May struck the bar, but shortly afterwards the home side doubled their advantage. Bythway and Liam McPhillips combined to set up Earl who made no mistake from close range. On the hour, a scooped effort by Bythway hit the bar then after Walton had a shot fisted away by Liversedge, Round headed home midway through the half following a cross by livewire Bythway. Substitute Lewis Davison placed two efforts wide; Liversedge pushed away a drive from Johnson and a 30 yarder from Walton drifted narrowly over before the goal of the game arrived in the 86th minute. Guisborough had paraded boxer Josh Leather as their guest before kick-off and when Gell fired an unstoppable right foot screamer from 20 yards into the top corner between post and crossbar, it proved to be the knockout punch. Ashington: Grant, Airey, Oliver, Ferrell, J Taylor, Christensen, Downey, Shaw, Walton, McClelland (Davison 72), Johnson. Subs not used: Egen, Bolton, B Middleton, Barnard. In appalling weather conditions in midweek, Ashington wrapped up a deserved 2-0 victory over Durham City with second half goals from Andy Ferrell and Marc Walton. On Saturday, December 20, Ashington are at home to North Shields, kick-off 3pm.